If you're feeling overwhelmed by the amount of niches out there, don't worry. 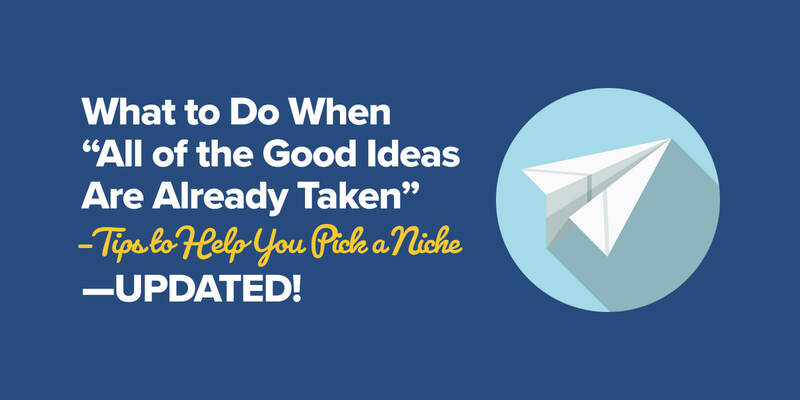 This post takes you through the niche selection tips you need to get started in your business. The difficulty of selecting a niche. Why you shouldn’t focus on a brand new niche. Why better is better in niche selection. The key to niche selection: delivering value to your audience. How to focus on specializing in your niche. Most people tell me that all of the good ideas (or keywords) are already taken, that there is too much competition and no more room left for them. If you feel this way, or you know someone who does, this post will help. It’s right up there with choosing where to live, who to date, or what degree to get. Your actions and your entire future start the moment you make a decision—and of course, you want it be the right one. There are an infinite amount ideas that can turn into successful websites and online businesses, even within saturated markets, you just have to spend time to figure it out. It is NOT easy, and if you really want this, you cannot give up. Selecting a niche is a long-term decision, but if it’s the wrong one, it’s not a long-term loss. Sometimes it’s not going to be the right decision, even with the time, energy, and passion you put into it. Sometimes you’re going to fail. The key is to be patient, think critically, and make the best decision on what you have before you. That’s why I’m here. These niche selection tips and strategies will help you during your business niche selection process so you can give yourself the best chance for long-term success. In order to succeed online, you cannot do what everyone else is doing. Follow the crowd, and get lost in it. Unfortunately, many people interpret this to mean that they have to create something totally brand-spanking new, something completely innovative that has never been done before, in order to succeed. It’s difficult to think of something totally brand-spanking new. Even if you do, you are playing in unknown territory. The more intelligent approach is to forget about starting fresh, and start with something that’s already working, and make it better. In the early 2000s, the Segway was invented to revolutionize how people walked and how streets and cities were designed. Segways are now banned on the sidewalks of 30 states in the US and security guards at the mall are taken a little less seriously. Changing how people walk is a tough mountain to climb. Now take Tesla Motors, on the other hand. Tesla isn’t reinventing how people get around—the company is still making cars – it’s just making the car better by making it smarter and more efficient. The same is true of Tesla’s foray into space travel (SpaceX) and public transportation (Hyperloop). People want better, so give them better. It doesn’t matter how much competition there is—if you can give them better, and you’re delivering actual value to your audience, that’s a win. It also doesn’t matter how BIG your niche idea is. Sometimes the advantage is in going small. So how do you know what’s better? Be a consumer, a customer of products within that market, and be conscious of your experience and the experience of others in that market as well. Read comments, reviews, participate in forums and discussions and truly get to know who your potential target audience is by becoming a target yourself, and figuring out, along the way, what needs to be improved. The only difference between you and everyone else in that market is you’re there on a mission to make things better and to give your customers an experience they’ve never had before. In general, it’s great to think big and shoot for the stars, but when it comes to niche selection you can get more results, faster, by thinking specialized. Start by picking a market that actually interests you. The competition doesn’t matter at this point—just pick something you like. Then, you’re going to pick a sub-section within that market, and then keep going deeper and deeper until you can get to a point where there’s a need and you feel like you can create THE GO-TO RESOURCE or become THE GO-TO PERSON for that topic. Whenever anyone mentions that topic in conversation, your site or your name will surface. Quick tip: If you’re looking for sub-sections of a particular topic, visit Amazon.com or some of the top websites and blogs that discuss that particular topic. Notice the hierarchy within the categories and menus. Other people call this “niching down,” and that’s essentially what it is, but when you approach it as a specialization within a larger market, your approach and mindset with your site and the content that you will provide on it becomes much different. YOU become the expert, and as a result, it’s easier to get featured or land a guest post on larger sites with larger audiences. It’s easier to get found in Google. The deeper you go, the less competition there is in Google. Plus, think about this: when people search for specific information they don’t search using general terms—they get specific because they want the most direct path to the information they need, which hopefully you can provide. It’s much easier to build your tribe. People in your specialized, target audience are more likely to have the same, more specialized interests as you and everyone else in the community. The connections made will be much stronger. The popularity of Mini Car Clubs is a prime example of the strength of community of a niche within a niche within a niche (i.e. car -> brand -> local). It’ll be easier to sell something. Since you become THE expert (or your site becomes THE resource), and because you know exactly who your target market is since they are all hanging out on your site, you can more easily (and without force) sell products of your own or products as an affiliate. If the niche enables you to work with clients, then of course people are going to want to work with you. In photography, dig deeper and specialize in studio lighting for photographers on a budget. Be that person. In cars, dig deeper and become the person who knows anything and everything there is to know about mini-vans for families with 2 or more children. In pets, think fish. In fish, think betta fish. In betta fish, think breeding. Breeding betta fish—own that space. An amazing example of this is Cassidy Tuttle, who made six figures in an obscure niche—teaching others how to raise succulents! We are at a point now with online business where you can be successful and make a decent living by specializing. You don’t need to own the entire market. You just have to own a specific piece of it, and it doesn’t have to be incredibly big. Below is video that I created for the Niche Site Course that I was going to release in 2013, but never did because after Google’s algorithm changes and some further tests that I ran, the process (the course in its entirety) only worked sometimes. I was not comfortable selling a course that only worked sometimes, so I scrapped it, even though it was practically done. That said, I still recorded some valuable content, including this video in Module 1 about what to do if you’re still having trouble with keyword research and niche selection. I also show you the exact method and seed keyword that I used to find the security guard training niche, which I used to build my niche site that is now earning about $3000.00 per month. Please note that this video runs for roughly 50 minutes. Actually select a topic. You can conduct research until your eyes bleed, but the truth is that until you have something up and running online, until you start producing content for something, you’re not going to get anywhere. It’s more beneficial to pick something that you could be slightly unsure of than to never pick a topic at all. You’ll learn more by doing than not. BRING IT. It doesn’t matter exactly how you say it: bring it, own it, dominate, blow people’s minds, go all out—whatever phrase you like best, it’s the truth. You must make something awesome. You must create value. You must serve your audience. Work on impressing the end user, and Google will eventually figure out what deserves to be where in the search engines. AskPat 1015: Which Niche Business Should I Focus On? AskPat 981: How Do I Present My New Niche to My Audience? AskPat 909: How Do I Find an Audience for My Niche? AskPat 951: How Do I Connect with Leaders in My Niche? AskPat 902: How Do I Collaborate with Other Entrepreneurs in My Niche? AskPat 931: Should I Expand My Niche into a General Industry?